Nano-hybrid composite with a patented matrix structure combines extremely high durability with minimal shrinkage for use in all Class I – V restorations. Just one layer provides exceptional results for simple restorations. Multiple layers allow you to duplicate natural tooth anatomy. Extended working time, even under operating lights, for more efficient sculpting. Contains: 10 x 0.25g PLT capsules. Venus Diamond was evaluated by 26 consultants in 641 uses. It received a 91% clinical rating. Venus Diamond is a low stress, light-cured, radiopaque, nano-hybrid composite that is suitable for anterior and posterior applications. 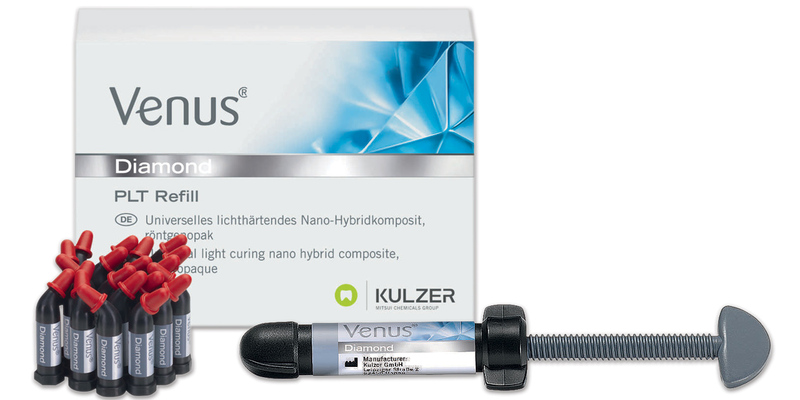 It is indicated for adhesively bonded, tooth colored restorations including: direct restoration of; Class I-V cavities; direct composite veneers; shape corrections of teeth; splinting of teeth; indirect restorations; restoration of primary teeth; core buildup; and repairs of porcelain and composite restorations in combination with an adequate repair system. It should be light cured 20 - 40 seconds per 2 mm increment with a halogen or LED light. Consultants reported that Venus Diamond has nice esthetics with easy polishing. The shade guide is made of cured composite and accurately matches the restorative material. Since the composite changes shade after light curing, shade matching with the guide is recommended. Handling in posterior applications provides adequate packability. When sculpting the surface of the composite, the material is rather sticky to the instrument and drags, making contouring a challenge. The body shades provided in the basic kit were a little too opaque to be used alone for high esthetics. 25% of consultants reported that Venus Diamond was better than their current composite and 54% reported it was equivalent. 58% would switch and 81% would recommend it.